To Print- click the image above or click here to print this Happy Drawing Colors and Shapes Worksheet. We love writing and drawing prompts that allow kids to think and be creative. Use this writing prompt to encourage the use of colors, shapes and creative thinking with a positive idea. Kids love to draw especially with color. 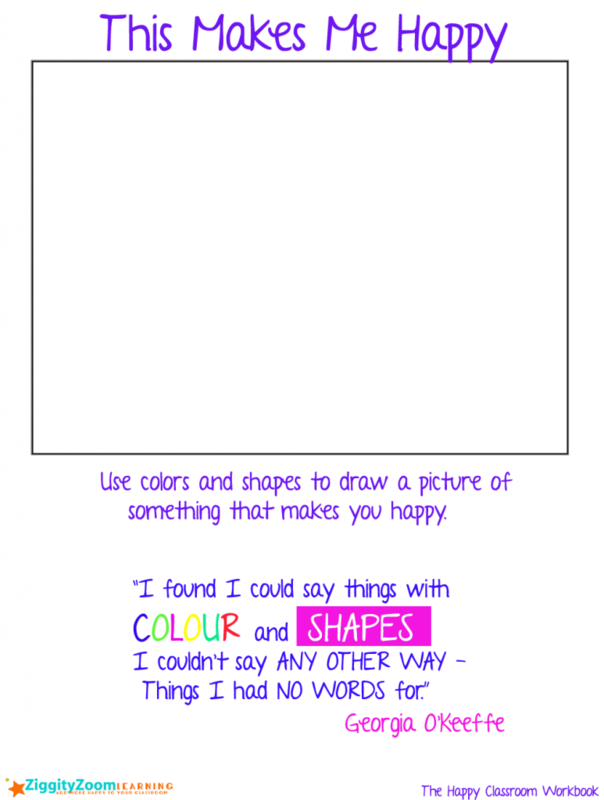 This writing and draw prompt worksheet is great for preschool or kindergarten to help with following directions- asking them to use colors and shapes to draw something that makes them happy. After they draw a picture, ask them to write 1-2 sentences describing what they drew. We also like the Georgia )’Keeffe quote that perfectly sums up that sometimes art or drawing allows us to express ourselves when we cannot think of how to write it. We hope you enjoy this worksheet. We are putting together an entire workbook called The Happy Classroom to encourage good citizenship, communication, positive words, creativity, and respect while still working on the many academic aspects of class work. Let us know if you like to receive an email when our Happy Classroom Workbook is available.